Journal Reference: Borque P, E Luke, P Kollias, and F Yang. 2018. "Relationship Between Turbulence and Drizzle in Continental and Marine Low Stratiform Clouds." Journal of the Atmospheric Sciences, 75(12), 10.1175/JAS-D-18-0060.1. Precipitation susceptibility (S0) computed for equally weighted liquid water path (LWP) intervals for the full data sets (black) and for bottom and top quartiles of eddy dissipation rate at cloud top (blue and red respectively) at (a) Black Forest (FKB) and (b) Graciosa Island (GRW) ARM sites. For each plot, the tops and bottoms of each box represent the 25th and 75th percentiles of the samples, respectively, the white circle in each box is the sample median, and the whiskers (lines extending above and below each box) represent the ends of the interquartile ranges to the furthest observations within the LWP interval. Turbulence is ubiquitous in atmospheric clouds and plays an important role in cloud dynamics and microphysics. This work presents statistical properties of turbulence and precipitation in continental and marine low stratiform clouds from ground-based observations. The relationship between turbulence and precipitation shows that under similar macrophysical conditions, high (low) turbulence is likely to lessen (enhance) the suppression effect of high aerosol number concentration on precipitation. Increasing aerosol number concentration can decrease cloud droplet sizes and might suppress precipitation. On the other hand, turbulence is ubiquitous in atmospheric clouds and through multiple mechanisms can either enhance or suppress precipitation. This study investigates the aerosol-cloud-turbulence interaction by measuring the properties of aerosol, precipitation, and in-cloud turbulence in continental and marine low stratiform clouds. Our results show that stronger turbulence is likely to lessen the suppression effect of high aerosol number concentration on precipitation, suggesting that turbulence needs to be taken into consideration when studying the aerosol-cloud interaction. We investigate the aerosol-cloud-turbulence interaction by measuring the properties of aerosol, precipitation, and in-cloud turbulence at two AMF deployments, Graciosa Island (GRW), Azores, and the Black Forest (FKB), Germany. Precipitation susceptibility, S0, was used to quantify the influence of aerosols on precipitation. We found that for both continental and marine low stratiform clouds S0 is positive, consistent with the second aerosol indirect effect (aerosol-induced precipitation suppression). The main contribution of this work is the inclusion of the role of turbulence in S0. 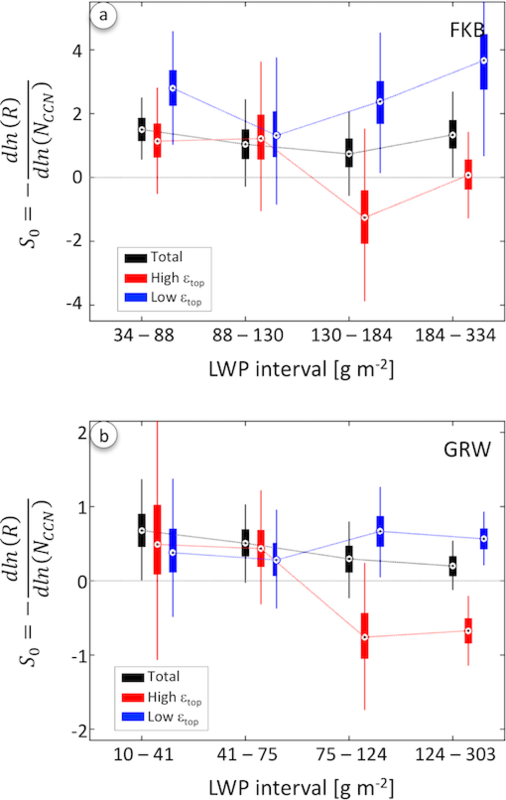 We find that for medium to high values of LWP, low turbulence at cloud top is likely to promote the effect of cloud condensation nuclei number concentration in precipitation suppression, whereas high turbulence is likely to counteract this effect. This is consistent with the idea that turbulence can broaden droplet size distribution by either condensational growth or collisional growth, thus promoting drizzle formation, and hence decreasing the aerosol influence on precipitation. Our results suggest that turbulence needs to be considered when analyzing cloud microphysical processes leading to drizzle formation and inhibition.